When I first saw a map of this route, I thought it was absolutely hilarious. Why are there two routes that both have the same number, yet the 34E is 9 miles longer than the 34? Why is the 34E labeled "E" if it goes west? I don't know the answers to these questions, but I do know that the 34E is a very interesting ride (I didn't actually take the 34, but it's basically a shorter version of the 34E). 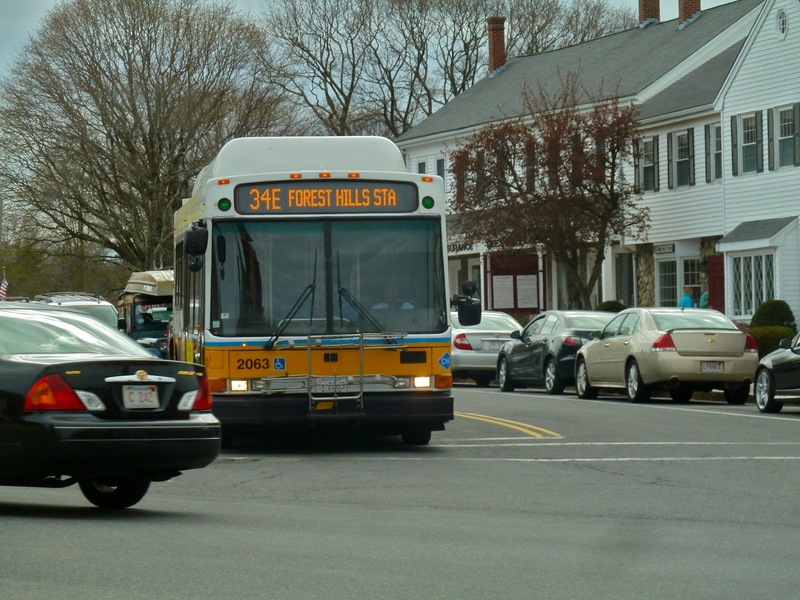 The bus starts at Forest Hills and travels down the overcrowded Forest Hills-Roslindale corridor (seriously, nine bus routes on a single street?). After going through Roslindale, things get more residential. However, businesses start popping up again approaching Dedham. 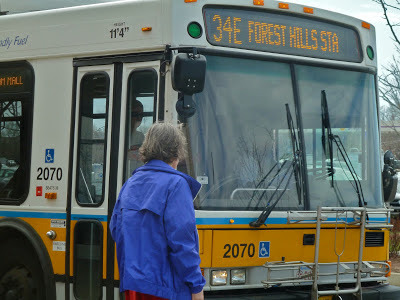 The 34 ends upon reaching "Dedham Line," (which is little more than a bus sign) but the 34E continues, making two stops in the Dedham Mall, and then becoming the only transit option on Washington Street. My rather squished picture at Dedham Mall of a bus going the wrong way. It then passes through the busy Dedham Square, but there are residences after that. It goes by Dedham Plaza and near Legacy Place (more on that later), but things are fairly quiet entering Westwood. There are mostly residences all through Westwood, with an occasional church or small business. It's the same thing in Norwood until you reach Norwood Depot and Norwood Center stations where there's a boom of businesses. The bus also travels very close to the Commuter Rail stations, about a block away from both Norwood Depot and Norwood Center. After that, there's an elementary school and a middle school very close to each other, where I'm assuming there's a lot of traffic on weekdays. After entering Walpole, there are houses and a weird industrial building. Washington Street passes over a river, offering a nice view, and then the bus turns off onto High Plain Street. High Plain Street turns into East Street, and the bus passes another school. East Street then goes into Walpole Center, and the bus ends. This is only one variation of the bus, however; my father and I ended up on the route that goes via Walpole Street and Main Street. This route breaks off at Norwood Center onto Walpole Street. There are mostly houses along this stretch, although there is a baseball field and a small mall along the way. Once Walpole Street becomes Main Street, however, the businesses pick up and the bus goes by yet another school, a high school this time. You can catch a glimpse of Cobbs Pond through some trees as the bus passes by two other malls. As our bus entered Walpole Center, however, my father and I were the only people on the bus besides two young women. The bus driver suddenly turned around and shouted "You're gonna be going to the police station right now." I was startled, so we instinctively got off the bus thinking the driver was talking to us. Turned out she was talking to the women: they wanted to get off at Legacy Place and the bus driver never told them when to get off. I don't know what that has to do with the police, but we all got off anyway. Turns out there's one more stop on the route, as the bus officially terminates at the Walpole Commuter Rail station. Not wanting to deal with the driver, though, we just crossed the street and waited for the bus to come back. The women made it to Legacy Place, by the way. A quaint little picture at Walpole Center. Ridership: If you analyze the route, it seems it would be students and shoppers (the bus passes or comes close to 7 malls if you go via Walpole Street). On our ride, however, it just seemed like people were using it to get where they needed to go; there would never be a huge crowd at any particular stop, although that's not to say the bus wasn't crowded. About 40-50 people on a weekday isn't bad at all (especially for half-hour headways). The 34, on the other hand, is a bus that I believe people mostly use as a Washington Street shuttle, based on its length. We saw 34 buses that were absolutely packed to the gills. Pros: For the 34E, half-hour headways on weekdays and Saturdays is great considering how suburban it is. The 34 is even better, running every 8-10 minutes during rush hour (although it has the same schedule as the 34E at most other times). The 34E serves a massive area without adequate transit. Sure, there's the Commuter Rail, but the 34E runs more often and is way cheaper. The Commuter Rail from Walpole to Boston is $7.25, while if you have a CharlieCard, the 34E is only $2.00 with a subway transfer. If this is your daily commute, the 34E can save you a lot of money (but it takes longer). This is the easiest solution: I don't think two completely different bus routes should have the same number. Why not change one of them and make things a lot easier? "Dedham Line" is really not much of a terminus. 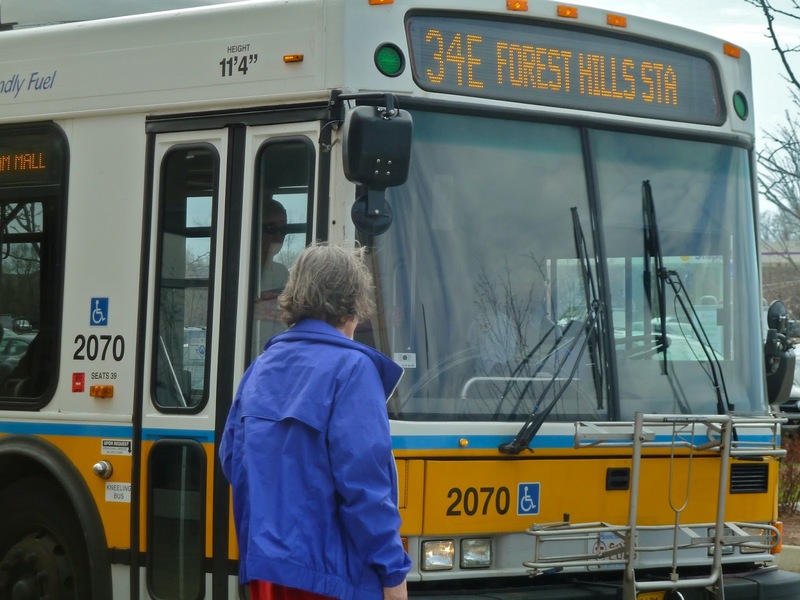 Couldn't the MBTA extend the 34 the extra half-mile to Dedham Mall or even Dedham Square? All I'm saying is that the 34 should have an actual terminus. This is the hardest, but it might work. If the MBTA just increased the schedule, they would probably be using the same amount of buses as they do now. The crowds might be a bit large, though. Nearby and Noteworthy: I've already talked about the Dedham Mall in my 52 post, but this is the only bus that goes by a very nice mall: Legacy Place is an amazing outdoor mall (which is a rare thing nowadays) that feels like downtown in a small city. The problem is that you have to traverse some difficult crosswalks to get to it from Washington Street, although it's worth it. The Showcase Cinema de Lux theater inside the mall is very luxurious. My father and I saw Jurassic Park 3-D there, and it was a great experience. Good movie, too. I personally prefer the 34E, but both buses are very good. The 34 serves as a (sort of) frequent shuttle along Washington Street, while the 34E goes way out into the suburbs and is much cheaper than the Commuter Rail. I do wish the buses had better service on Sundays, and it would be great if the MBTA went through with one of the solutions offered under "cons," but it's a very good bus route (sorry, two bus routes) overall. Latest MBTA News: The state voted unanimously to add a new "Boston Landing" Commuter Rail Station in Brighton on the Framingham/Worcester Line. Read this article for more information. Ridership on the Fairmount Commuter Rail line is terrible, despite new stations, according to this article. Don't forget, there are shuttle buses between JFK/UMASS and North Quincy stations on the Red Line this weekend. Some buses to the City Point area including the SL2 are experiencing diversions on Sunday (May 19). Read about them here. Finally, some buses in the Mattapan area are experiencing diversions on Sunday due to the Haitian Unity Parade and Festival. Read about the diversions here. This has bugged me for a long time, since I take it to work, and it's the best reason I've come up with. Oh, yeah, that makes sense! It's easier to say than "34W," at any rate. W stands for the Wonderland variation, and 34W would sound like it goes to Wonderland. Maybe it stands for East, as in east Walpole? What kind of bus you mean ? There are no buses in Massachusetts, we travel by ocean ships, that's why 34"O" stands for Ocean State, sand 34E and 34 are two asylums down the road. A little history, originally the 34E was operated by another carrier since Dedham and beyond were not part of the old MTA. When Dedham, Norwood and Walpole became part of the MBTA, the T took over that route and it became the Express to the Dedham line. Making stops only in Roslindale Square and a couple of other intersections. It became the Extension of the 34 route, hence the E designation. Plans now are in the works to rationalize the service and combine the routes and service.